Visit the Stan Miller Yachts display at the upcoming San Diego International Boat Show, June 7th through the 10th, and tour two brand new boats as well as a variety of pre-owned boats for sale. The SMY San Diego sales team of Blake Oversmith, Geoff Swing and Steve Blackman will be on hand to show you aboard. The company will be displaying a 2018 Viking 37 Billfish. Fresh off of her exciting debut at the Lido Boat Show in Newport Beach, the Viking 37B is a ‘must see’ on your San Diego boat show list. The new Viking 37 Billfish is ready to tackle San Diego and Mexico’s best cruising grounds. She’s stocked with twin Cummins QSB6.7 550hp diesels, a spacious cockpit, and all the extras to have a great day on the water. Be sure to check her out at the show! She’s in stock and available for sale. Stan Miller Yachts also has some great cruising yachts on display and for sale, including a brand new 2018 Sabre 42 Salon Express. The 42 is one of Sabre’s most popular models, perfect for a couple or a family. She’s easy to maneuver and dock, even single-handed, but still has plenty of living and outdoor space to host friends for cocktails. With upgraded Volvo 370hp diesels and IPS500 pod drives, the Sabre 42 is ready to speed off for a sunset cruise or weeks exploring. You’ll also have the chance to check out a variety of pre-owned boats for sale. As of press time, the display will include a 2007 Hatteras 64 Motor Yacht and a 2007 32 Legacy Hardtop Express. 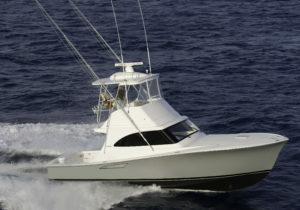 Visit the Stan Miller Yachts website for a full list of boats on display, at www.stanmilleryachts.com. Stan Miller Yachts is proud to be the authorized dealer for some of the finest boat building brands in the world. In addition to Viking and Sabre, the San Diego show is a great opportunity to see what’s on the horizon with builders like Back Cove, Mag Bay and Sanlorenzo. Stop by and visit Stan Miller at their San Diego office at Intrepid Landing, or visit any of their other three offices in Long Beach, Newport Beach, and Seattle, Washington.